Writing your infrastructure as though it were code is a huge step forward from the days of past. In a single step, you will be documenting your entire stack while orchestrating the creation of its infrastructure. A second, even larger benefit, is the ability to version control your infrastructure. Imagine being able to stand up an entire production or staging infrastructure in less than an hour, rather than days. In this article, I will guide you through the process of standing up a fairly simple, but common, infrastructure hosted on Amazon’s Web Service. The diagram below illustrates how the infrastructure will look after the Terraform config is applied. Terraform is a product released by HashiCorp that abstracts away from your provider’s API layer, such as AWS in this case, allowing you to document your whole infrastructure in a JSON-like language that is easy to read and understand. The tool itself goes well beyond Amazon AWS. There are a number of providers available, such as for VMWare, DigitalOcean, and Heroku to name a few. Extract the downloaded Terraform archive into a directory set in your PATH environment variable. We start by defining our provider, which in our case is AWS. You will need to set some values that allow Terraform to connect and communicate with Amazon. Create a directory to hold your Terraform files. Create a file with the extension “.tf”. In this example, the filename myapp.tf will be created. Open the tf file into a text editor. Add the following contents to it. We set the provider to “AWS” to signify it is for Amazon’s Web Service. We also specify an access key, secret key, and the region we will be building the infrastructure in. Define a VPC named “myapp” and set the CIDR block to 10.100.0.0/16. Add two subnets for our public servers. Explicitly set the availability zone to ensure the two are always created in separate ones, as we will want to ensure redundancy. Because they are both public, set the map_public_ip_on_launch to true. To allow Internet access to our servers, add an Internet Gateway to the configuration. description = "Allow inbound SSH traffic from my IP"
Create a security group to allow web server access to the public. description = "Allow HTTP and HTTPS traffic in, browser access out." Create a security group to allow MySQL RDS Access to the web servers. 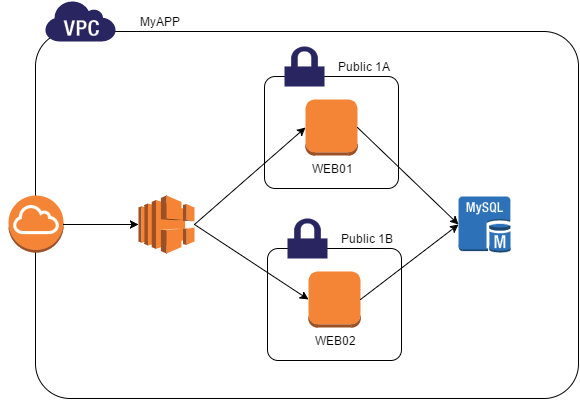 description = "Allow access to MySQL RDS"
With the network infrastructure in place, it’s time to start defining our EC2 instances. Create two instances for the web service, with one in each public subnet defined above. The instances will both be t1.micro, and they will both run Ubuntu 14.04 LTS. Define an ELB to attaches to the two public subnets, add both web EC2 instances, and set an HTTP listener. Create the DB Subnet Group. description = "Our main group of subnets"
Name = "MyApp DB subnet group"
With the base infrastructure defined our files should be added to version control. Using Git, initialize the repository and commit the changes. If your text file is still open, save it and then close it. Add the “.tf” to the repository. Create the initial commit for your infrastructure. Our infrastructure is now under version control and ready to be deployed for the first time! Run the following command to deploy your infrastructure using Terraform. Run the following command to delete all resources created by Terraform.